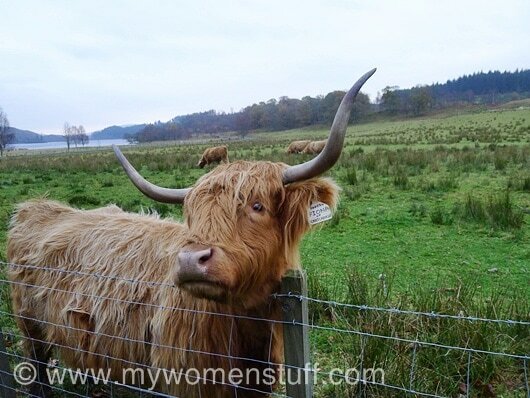 Whatever you do, just remember NOT to steal photographs from other bloggers or websites. It is rude and unethical and undermines your credibility. Also, remember to credit your source where you can with a link. Using photographs belonging to others without credit is as good as walking into their bedroom and swiping their favourite lipstick. Contrary to popular belief, you do not need a DSLR camera to get good photos. Yes, a DSLR gives you the ability to take better photos because of the bigger sensor and lenses and yes, you look all swanky and professional lugging one around. But for blogging purposes, all you really need is a digital compact point and shoot and these are pretty inexpensive these days. Your intention is to capture photos on the fly anyway. Mobile phone cameras don’t do quite as well in my view for proper product shots, unless you plan to take quick sneaky photos. The colour always tends to be off because the sensor is tiny even by comparison to compact cameras and the macro function isn’t up to par. Let me show you a collage of an item taken using 3 different cameras. This collage was taken under natural lighting conditions. Indoors, the mobile phone quality deteriorates very quickly. So if you want to maintain a blog, get a compact camera – as I have noted, you can get pretty decent ones these days quite inexpensively – cheaper than your mobile phone probably. You don’t need something from the top of the range so long as you know how to maximize your camera’s potential. Before you go ahead and shoot your photos, spend some time to get to know your camera and its functions to get the best out of it. If you have been experimenting, you might be wondering how to get a good close up shot of the product you want to showcase, or a picture of your eye or face or lips. 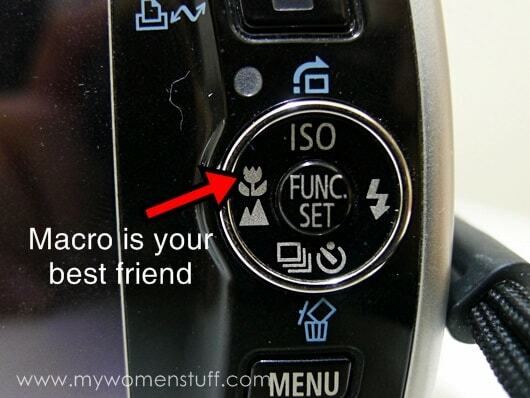 Its time to get familiar with the Macro feature on your camera. Look for the flower symbol. That is usually the symbol to activate the Macro feature. Turn it on and get close to your subject matter. Now, doesn’t it look much clearer and sharper now? How close you can get to your subject matter depends on your camera. Some, like the Lumix LX-5 I presently use can practically sit on top of the product and still get a nice clear shot. The Canon G10/G11/G12 I previously used can get up to 1cm close. Anything less than 1cm and it gets blurry. To get accurate colour for your photos, you need to watch your lighting. 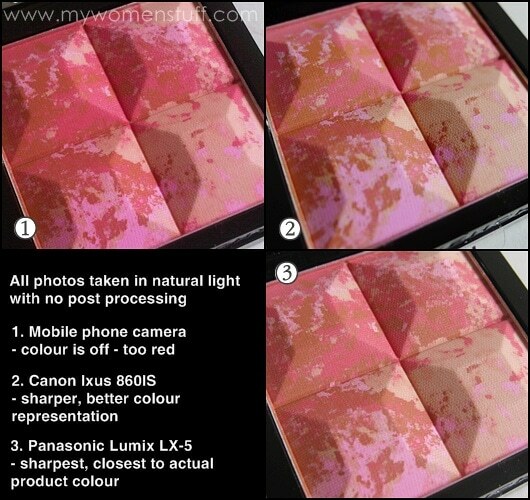 For beauty blogs, and for colour representation and swatches, I suggest the use of natural light whenever possible. Natural light isn’t direct sunlight though. That can still blow out your photo and wash out colours and create harsh shadows. Natural light is daylight. However, not all of us have the privilege of taking photos in the daylight and sometimes, I too face that problem. If you take photos under fluorescent lighting or tungsten lighting, adjust that on your camera accordingly to get a better colour representation so you do not end up with too much blue tones (fluorescent lighting) or yellow tones (tungsten lighting). If you still can’t get it to show the correct colour, try setting the white balance. 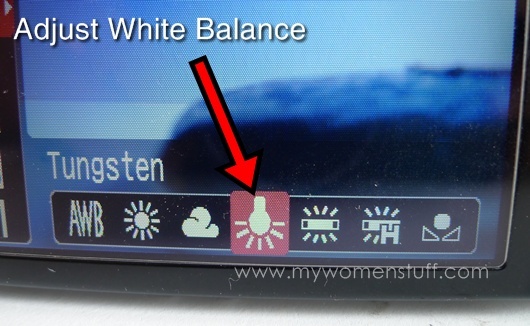 Most compact cameras these days allow you to set the white balance. Look for this feature on your camera and activate it. Now, take a white piece of paper or face a white wall and follow instructions to set the colour in your camera. 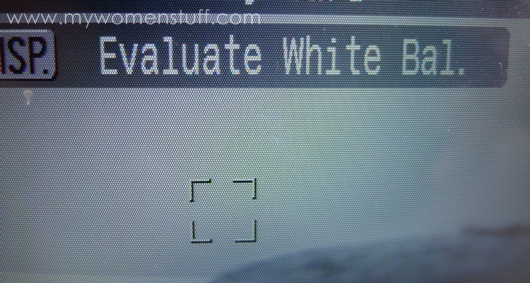 What you have just done is to get your camera to adjust its colour to show white as white (and not yellow or blue). It does not always work, and you might still have to compensate in one way or another, but it gets it to be a more accurate colour than if you did not set white balance. 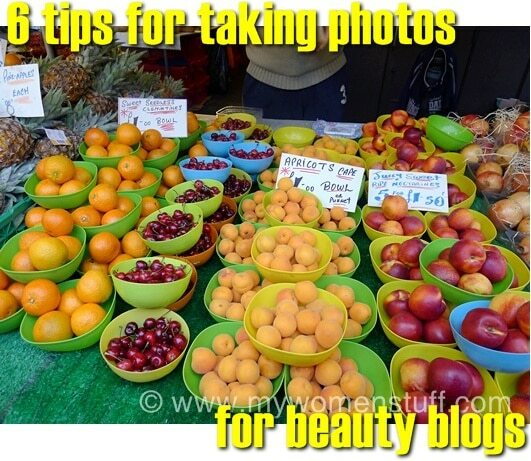 I’m a food blogger too (sometimes) and this is something I learnt while blogging about food, that I carried over into my beauty blog. Using the flash washes out your photo and makes it look less appetizing. Unless you have a swanky large swivel flash that you can use to bounce off walls or ceilings to create artificial light, most compact cameras come with a direct flash that flashes straight onto the subject matter. 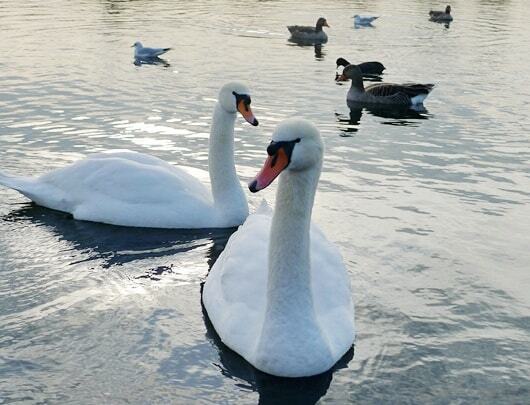 This can create harsh lines, washed out colour and a blow out which usually makes your photo less interesting. So, if you can, try not to use the flash. If its a little dark, try facing the window and do not block the light source. What this means is for you to face the window when taking photos, not with your back towards the light. Beware also of too much light or of backlighting (lighting directly behind object). However, I do use the flash sometimes too – sometimes its just too dark to get a good picture. When you do plan to use the flash for close up photos, turn on the macro feature, reduce your exposure where possible or reduce the flash output if possible and then take your photo. Or place a piece of tissue paper over the flash when you take the photo. This can help soften the effects of the flash. As with everything, practice! Carry your camera with you and learn its functions. Practice, not just with beauty products but with anything you can shoot. I enjoy taking photos and I usually have a camera with me most of the time. I do not own a DSLR however. I decided not to go down that route after much deliberation, because its size and bulk would detract from having a camera on me all the time and taking photos spontaneously, which is what I enjoy most. PREVIOUS POST: Hada Labo Gokujyun Super Hyaluronic Acid Moisturizing Cream : Wordy but Worthy? wooo….useful tips!! I always have problem with everything you mentioned above!!! This totally helps!!! Thank you so much Paris!!! Great tips! Yes, I always use Macro function for almost all my photos. And I don’t use flash for any photos. But I need to check out the light and white balance function in my Sony. Welcome! Most compact cameras these days allow for adjustment of white balance or lighting at the minimum. Look under the manual settings where it usually resides 🙂 Sometimes flash can be very useful in a very dark setting, provided its diffused. okie, me thinks i did what you have suggested except the white balance! now maybe i need go tinkering on that… hm… hopefully i get better pictures! i hate it when the colour is so off, especially for swatches! These are excellent tips, PB! 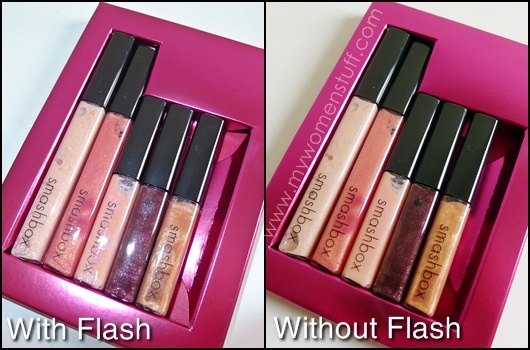 I’ve been beauty blogging for 2 years and a bit now, but my photo taking skills is really not up to par at all. Still learning and these tips of yous is absolutely amazing as a starting base. 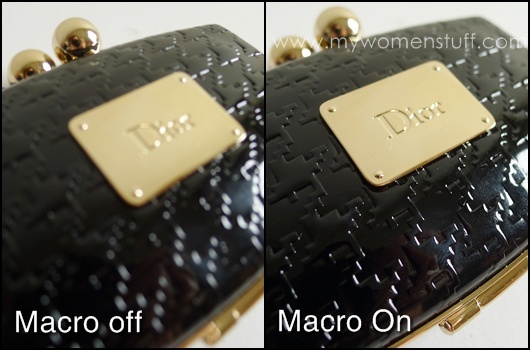 I’m glad you found these useful 😀 The macro function is an amazing tool for getting really nice close ups, especially for swatches, face shots or artistic shots 😀 Happy photographing! Will be getting a new P&S camera when I’m back in M’sia. Prices here are ridonkulous. Thank you Tine! I love how having a mobile camera allows us to sneak all those shots and leak them out haha! But for a serious blog, it just doesn’t cut it does it? 🙂 I guess Asia is still best for electronics – decided on the model you want yet? Great article! 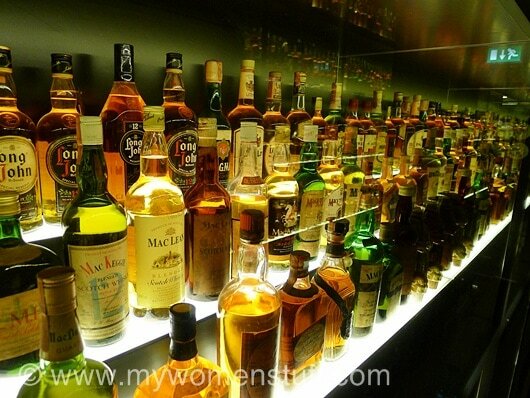 Last photo….. from the Scotch Whisky Experience? Dear, this is a very helpful post!!!! Thanks for the tips, definitely learnt a thing or two from it! You have no idea how much I love you for this post. Been looking for some tips like this myself. This sums it all up. Thanks a ton. This is one useful one!! Thanks for the tips Paris. Yeah, flash over food can turn the most lovely of dishes into a horror scene! But it is useful in dark restaurants. And you can always balance the light afterwards in Photoshop.^^ As you can see, I’m not a very accomplished photographer but I’m better at editing. I gotta take some classes! hey, this is great advise!